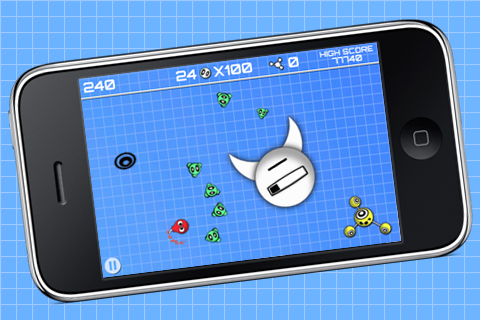 Pros Clean graphics, Addictive Gameplay, Nice Balance of Risk vs. Reward	Cons The feedback-like (headache inducing) soundtrack. 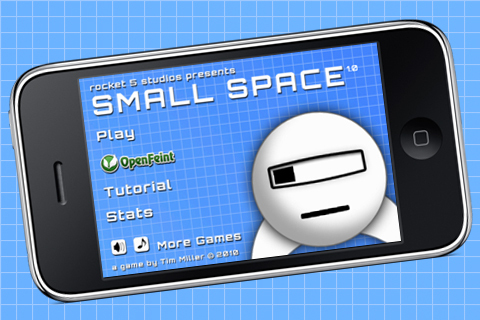 Rocket 5 Studios (developer of Giant Moto) is about to release their second app, a casual arcad-style endurance game called Small Space. In Small Space, you must carefully pilot your ship, collecting as many of the little green “Yummies” as possible and then deliver them to the yellow space station (Hungry). The catch is that for each Yummy that you pick up, your spaceship will get bigger, making it that much more difficult to avoid the randomly spawning (red) Meanies and black hole-like Grabbies. If the main body of your ship comes into contact with a Grabby, the Yummies you’ve collected so far will be pulled from your ship, shrinking it, forcing you to pretty much start the level over. On the other hand, if you hit a Meanie then the game is over. Once you successfully transfer your Yummies to Hungry, you move on to the next of the game’s 30 levels, with each subsequent level getting increasingly more difficult. Small Space has nice, fairly simple, but well drawn artwork style which really pops against the grid-like blue background. Personally I wasn’t a real big fan of the in-game music, but the sound effects were good and you have the ability to listen to your own music while playing, so that wasn’t a big issue. 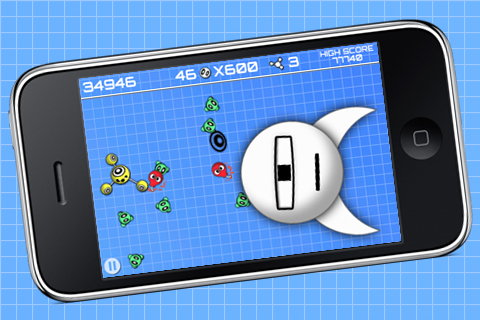 The gameplay itself is fun and addictive and has easy pickup and play, one-handed controls. Movement of your ship is accomplished just by dragging your finger on the screen to lead the ship where you want it to go. Rocket 5 Studios has really done a superb job in creating the perfect balancing of risk vs. reward, allowing players to be as aggressive or casual as they want to be. As you get bigger & bigger you increase the risk of having your Yummies stolen or worse! On the other hand, the larger you are when you deliver the Yummies to Hungry, the higher your score will be. The game’s per-transfer OpenFeint leaderboards are the key to making this balance work well and gives players an enticing reason to be greedy. With a minimum of just one Yummy required to perform a transfer, some players may attempt to blast through the levels as quickly as possible trying to obtain the “30 transfer” OpenFeint achievement, but they do so at the cost of obtaining any sort of high score on any of the levels. Although this is not as easy as it sounds, my early attempts at this style of gameplay were often and decisively thwarted by a randomly spawned meany right around level 21. I particularly liked the way the Grabbies toss you around a bit once they get a hold of you, although I felt that maybe their radius of pull should have been a tiny bit farther reaching than it was (at least while you are small). You will notice that the fins of your ship can touch the baddies without penalty, but collisions were intentionally implemented this way by the developer, otherwise as your ship gets really big it would literally become impossible to move without the fins touching something. Rocket 5 Studios definitely has a winner on their hands with Small Space. They’ve managed to find that perfect balance between easy pick up and play controls, simple, but addictive gameplay and risk vs. reward. At this time I don’t have information regarding the price, but Small Space should be appearing on the App Store sometime this weekend. You should definitely consider picking it up.